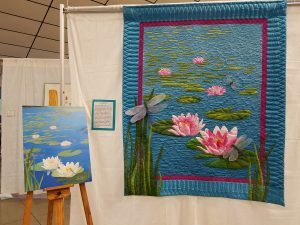 At our local Kitsap Quilters‘ Guild’s recent show, our featured artist was guild member Ann Trujillo. 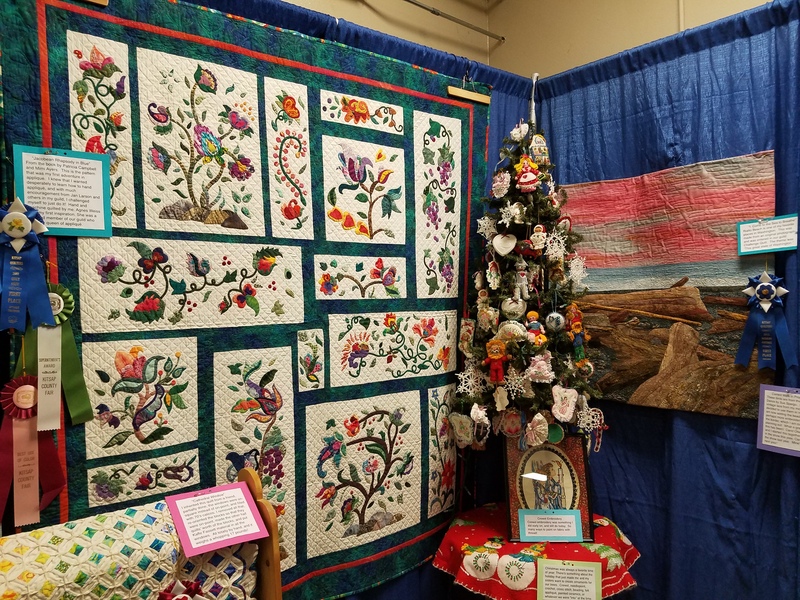 Ann has been been quilting for about 20 years, but has been involved in crafts such as embroidery and sewing doll’s clothes for much longer. 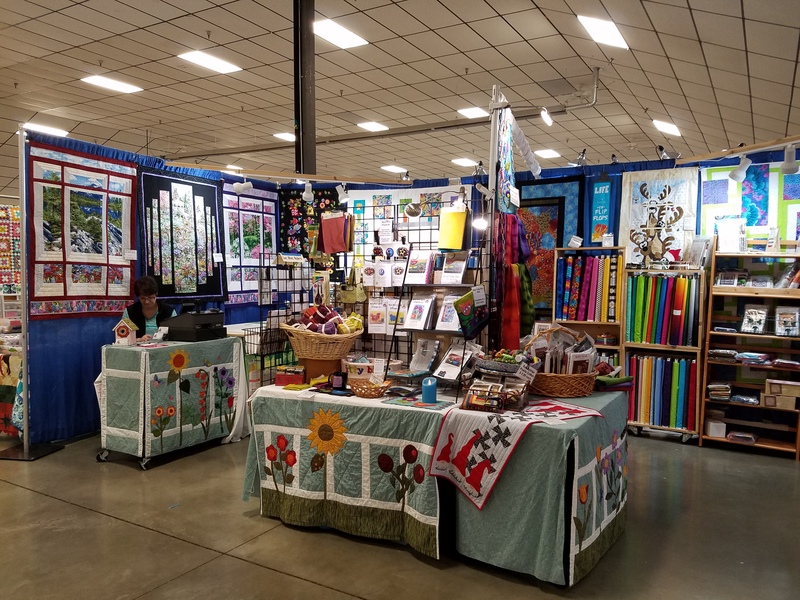 She has won many awards for her colorful intricate quilts and the booth looked beautiful with her magnificent array. 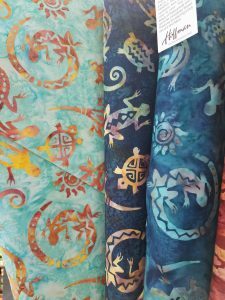 She loves to try different techniques and complex patterns. This bird quilt is a project in progress, with birds from the book Bird Dance by Sue Spargo. Ann inherited vintage lace from her mother and decided to use it in her blocks. 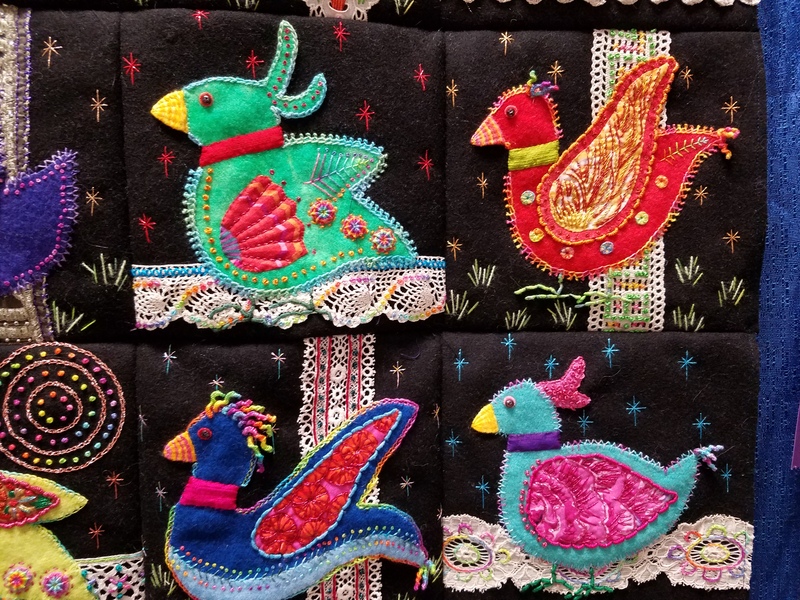 She is now adding more beads and embroidery and planning the border. These birds take on their own characters with all the wonderful embellishment. 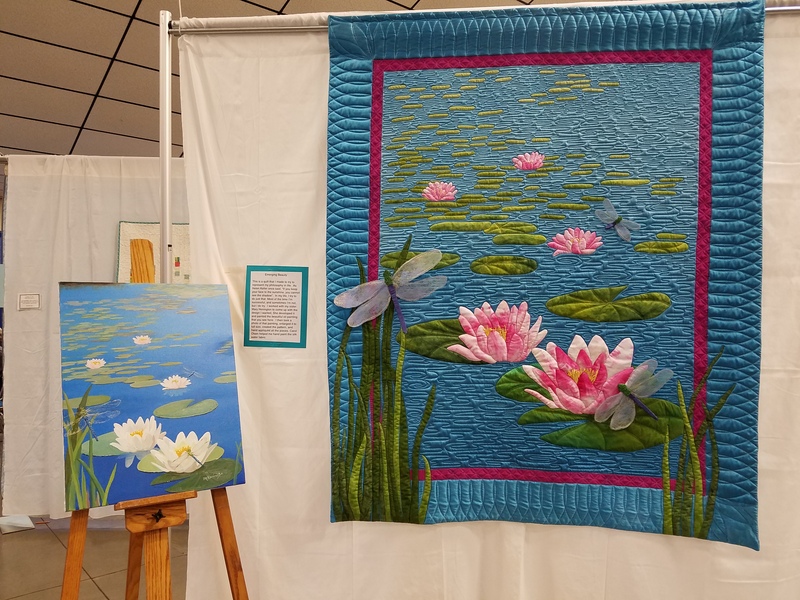 This luscious water-lily quilt, Emerging Beauty, was designed in collaboration with Ann’s sister, Mary Hennington, who painted the oil painting. 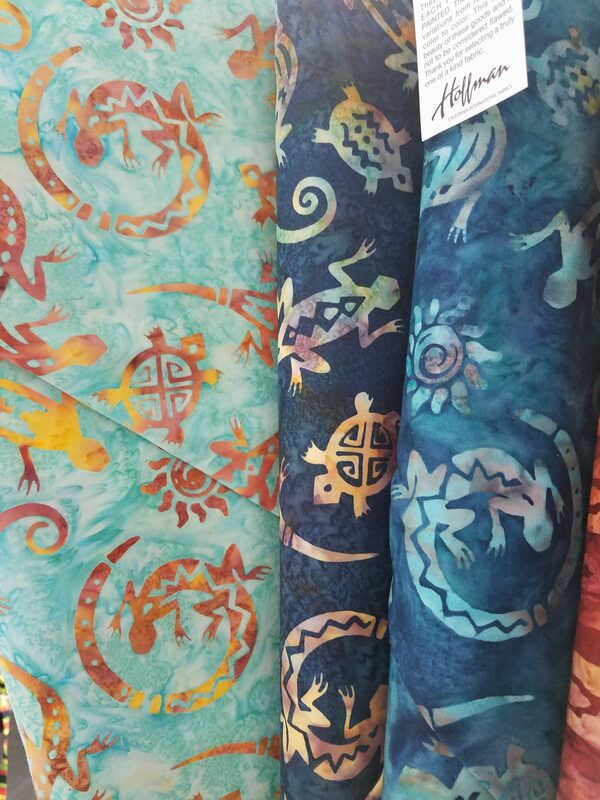 Ann took a photo of the painting and enlarged it to life size and used this to create the pattern. 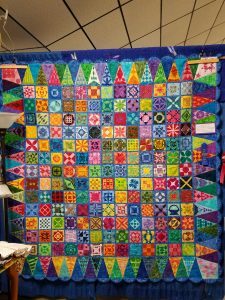 The quilt is hand appliqued and the silk is hand painted. 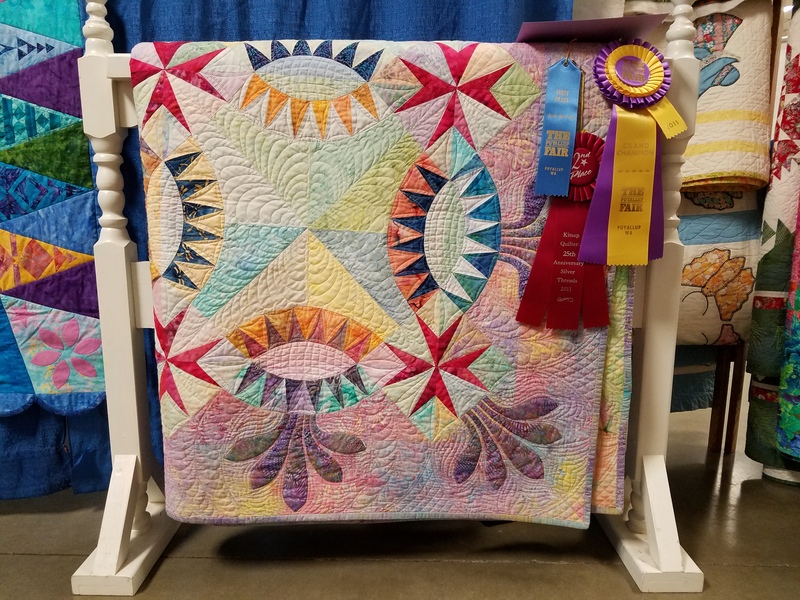 Marybeth O’Halloran machine quilted it. Ann is generous with her time and talents and loves to share, teach and encourage new quilters. 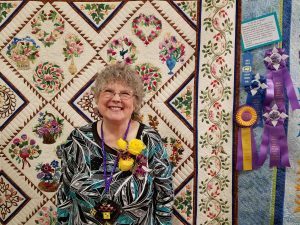 She finds helping quilters to achieve their goals very satisfying. Once a week she volunteers, teaching quilting and sewing at the Washington Correctional Center for Women in Purdy. 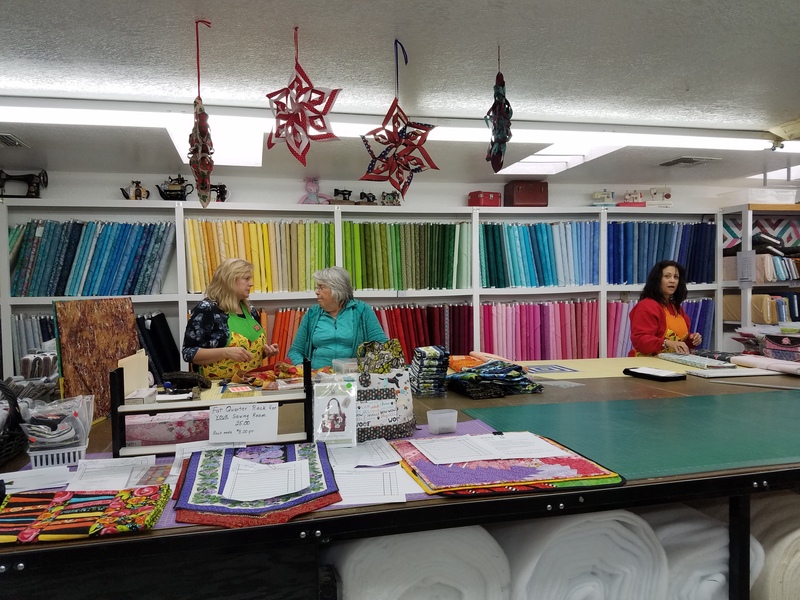 Last year, their charity program produced over 2,500 items for the less fortunate. 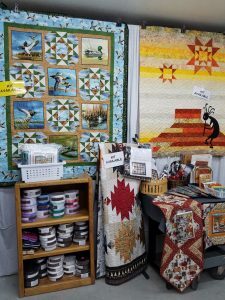 In addition to quilts, they make knitted items, stockings for our military, food bowls for the hungry, backpacks for kids, and much more. 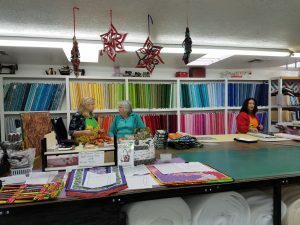 Ann works part-time at the quilt store, Quilted Strait, in Port Gamble, where she gives customers a warm welcome and puts her skills to great use helping them with their fabric selections. 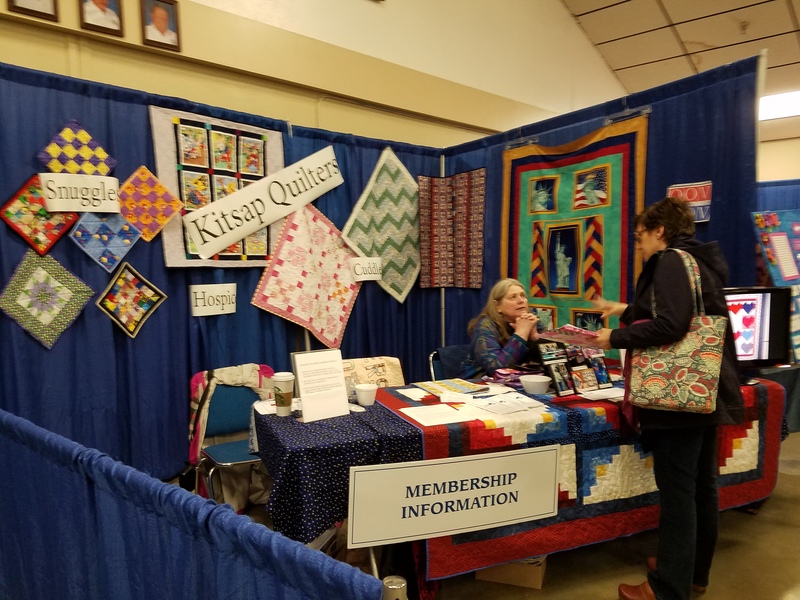 My local quilt guild, Kitsap Quilters’ Guild, held their annual show last weekend. 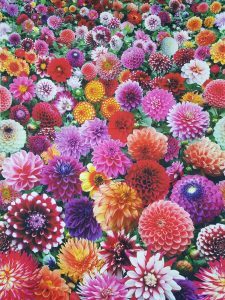 It was successful and everything ran smoothly. 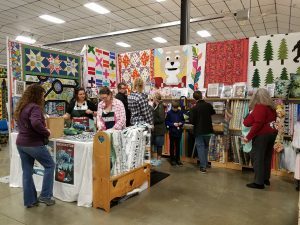 I’m blown away when I consider what it takes to put on an event like this with all the volunteers and the hours they contribute. 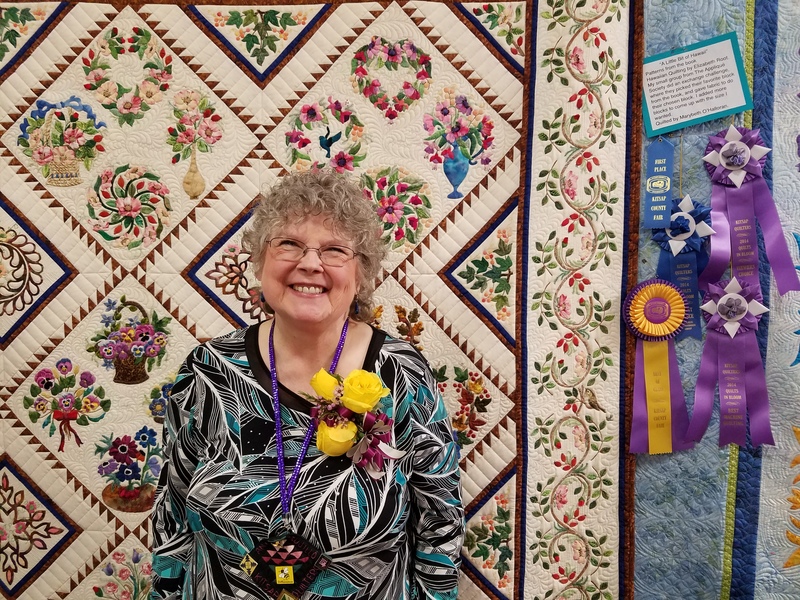 Our Quilt Show Chair, Gail Mann, did an outstanding job with excellent planning and communication with all the various quilt show committee people. 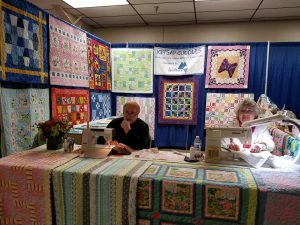 This was our 31st show and our experienced members know what to do. 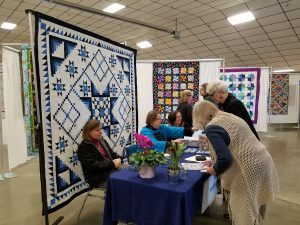 Our quilt hanging techniques have improved dramatically in the 25 years that I have been with the guild and the drop-off check in, and take-down procedures are slick. The pictures below illustrate some of the many components of our show. 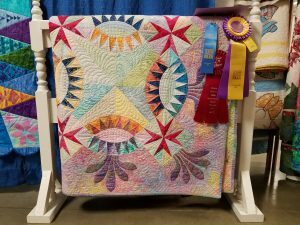 First of all there’s the quilts! 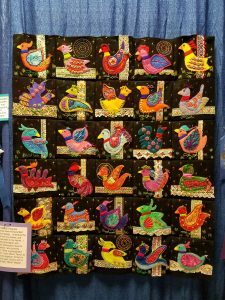 We had 199 in the show, plus a special exhibit from our talented featured artist, Ann Trujillo. I will post more pictures in subsequent blogs. 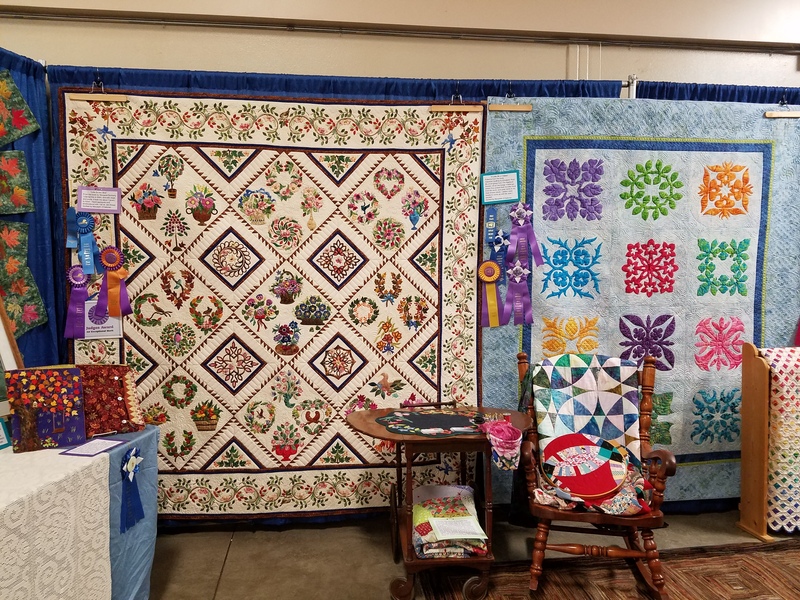 The first quilt right by the entrance which captivated the attention of show-goers was our opportunity quilt, Glacial Stars, designed by yours truly, pieced by me with major help from other trusty guild members, and beautifully machine quilted by Gladys Schulz, (more on this one in another blog). 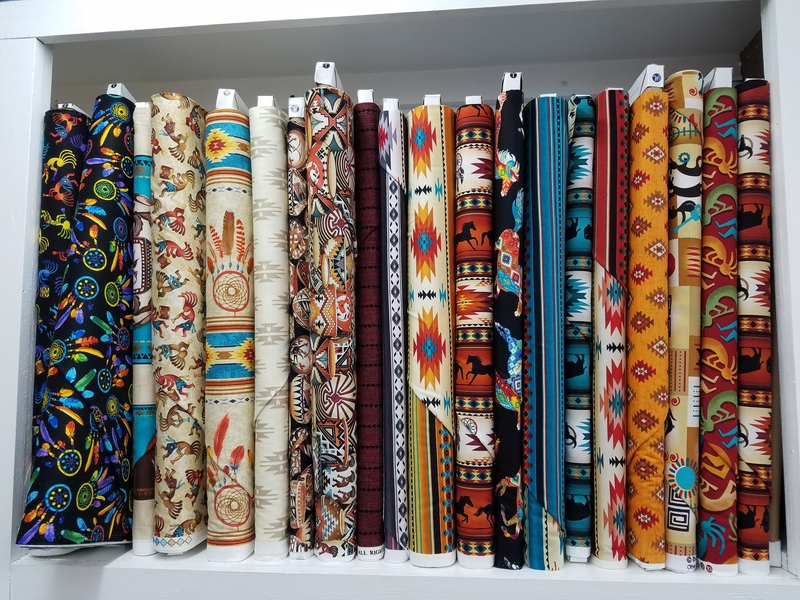 I’m proud to say that over 7,000 chances have been sold. Also near the entrance door, there was a welcoming membership information table. Here’s the lucky recipient of two of the silent auction baskets. 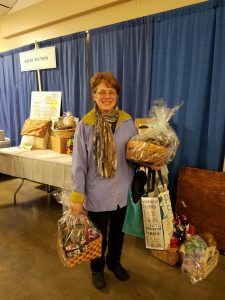 There were over 60 baskets containing items donated by guild members and local businesses. This is quite a fundraiser for the guild and putting together the baskets was a tremendous amount of work. 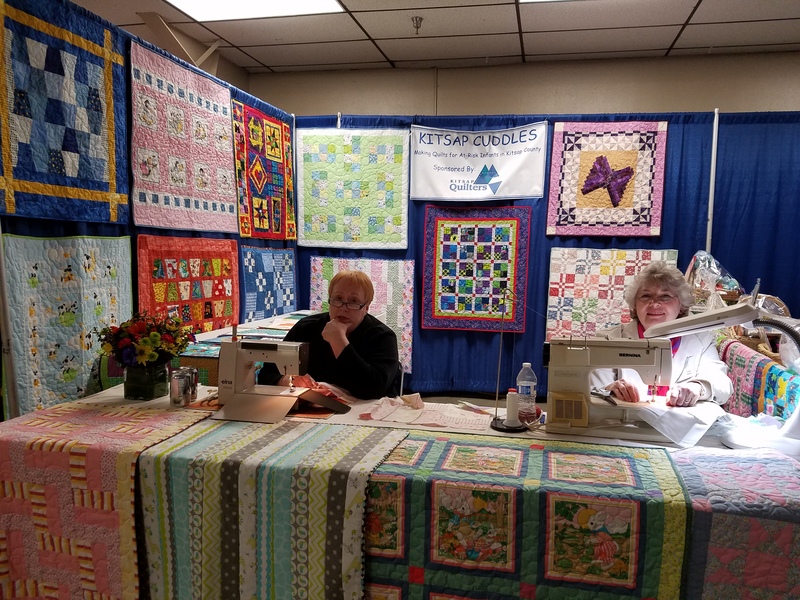 We also had a guild boutique, where members could sell unwanted fabric, books, half-done projects etc with 10% going to the guild. 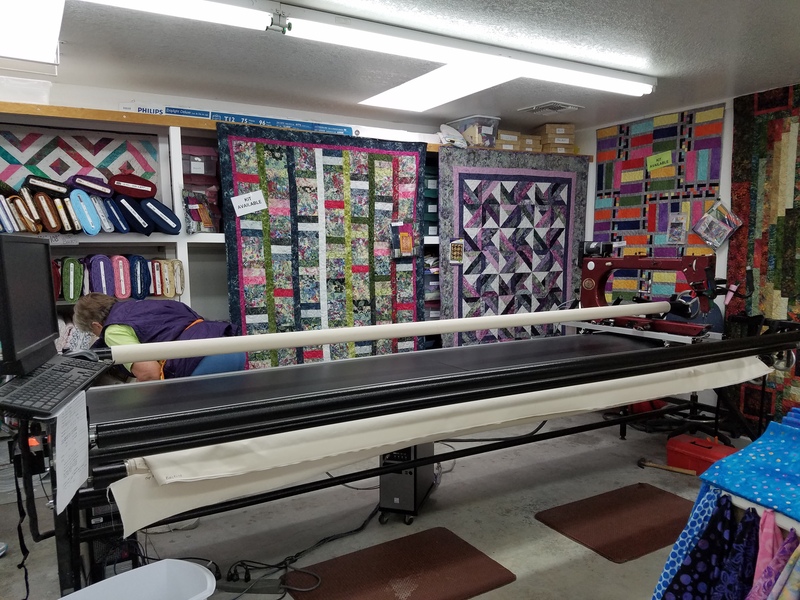 The other picture shows some of the many quilts made for our Kitsap Snuggles program and two quilters busy at work piecing quilts. 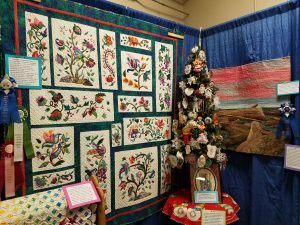 The quilts are wrapped around dolls and stuffed animals and distributed throughout Kitsap County to children in crisis and children with cancer. Of course, the quilt show would not be complete without our vendors giving everyone the opportunity to go shopping! 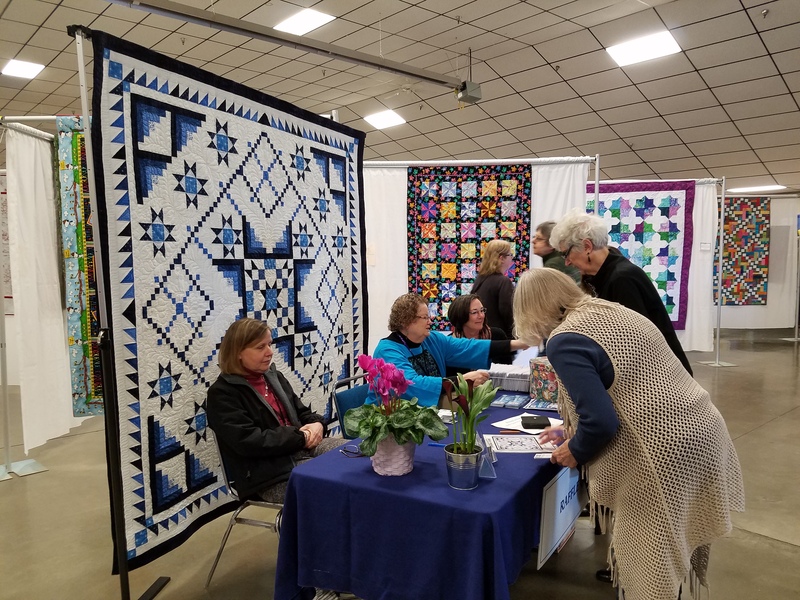 I hope that you will be able to support quilt shows in your area and that you will express you appreciation to the volunteers who you meet and who make it all happen. 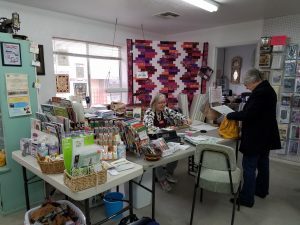 During my stay in Lake Havasu in January, my quilter host took me out to Monica’s Quilts in the Havasu Heights, a residential area about 20 minutes out of town in the hills. As you can see, the signage on the gravel road was homespun. 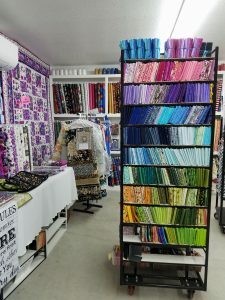 However, the shop itself was expansive with several rooms containing a large inventory and a long-arm quilting machine. 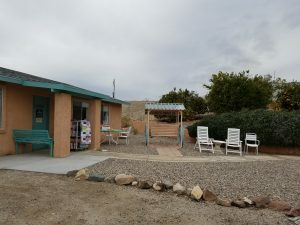 It was cool and rainy when I was there which the locals didn’t like! 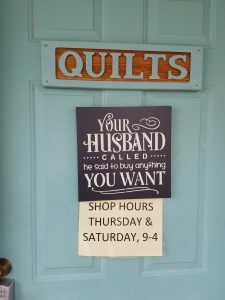 The store was warm and welcoming, and I recommend making the effort to find it. They don’t have a website, but you could call the owner, Monica Krug, at (928) 486-5583 for directions. 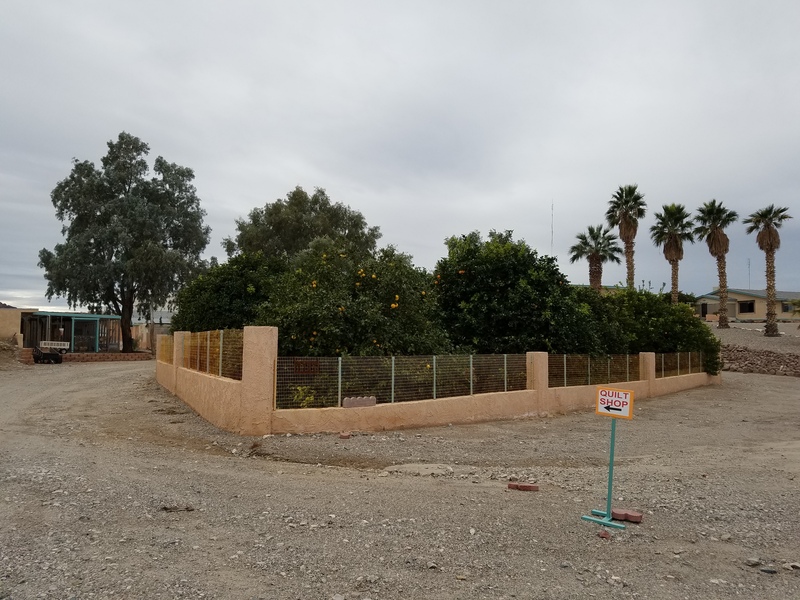 Here’s the address: 7737 Wagon Wheel Drive, Lake Havasu City, AZ 86404. 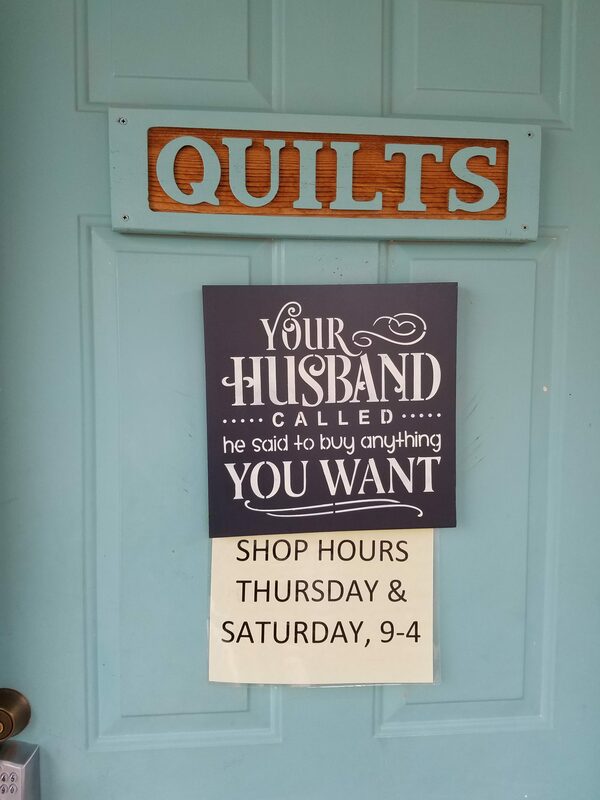 They are only open on Thursdays and Saturdays, or by appointment. 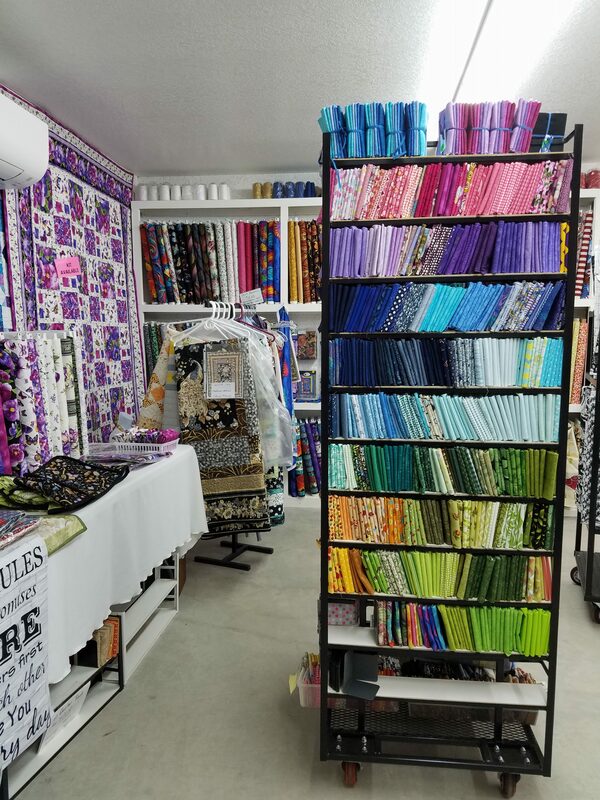 The local quilters love it and the store was busy all the time I was there. Here are some more views. 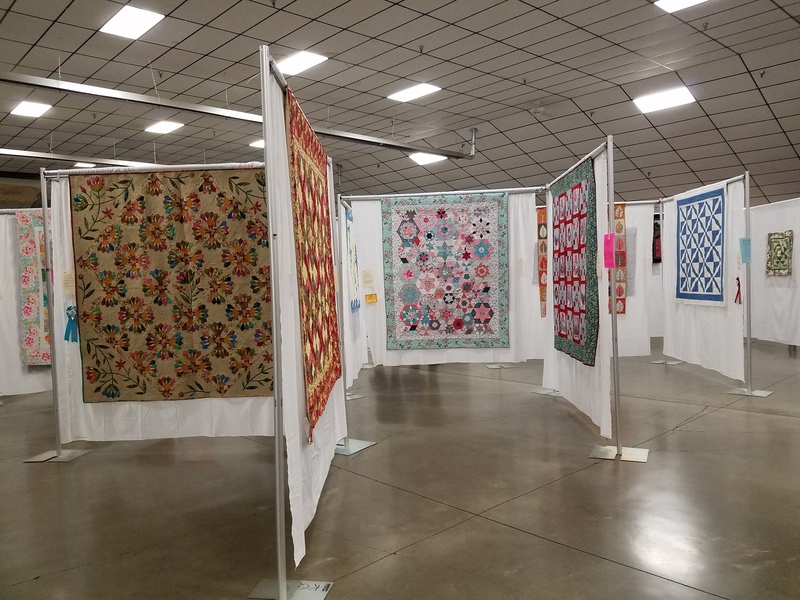 As well as a wide range of fabrics, there were several eye-catching quilt samples and they teach classes frequently, in a separate classroom on the property. 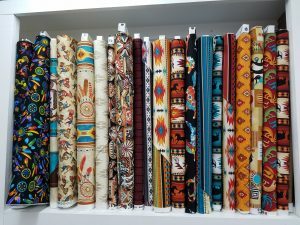 There was a nice variety of southwestern prints including some brand new batiks which had just arrived. 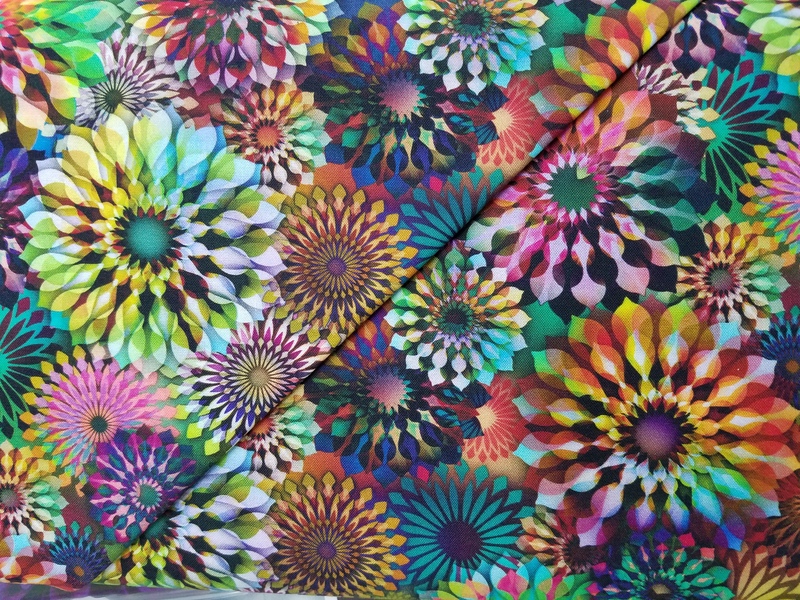 They also had some of the digitally printed panels which are amazing. 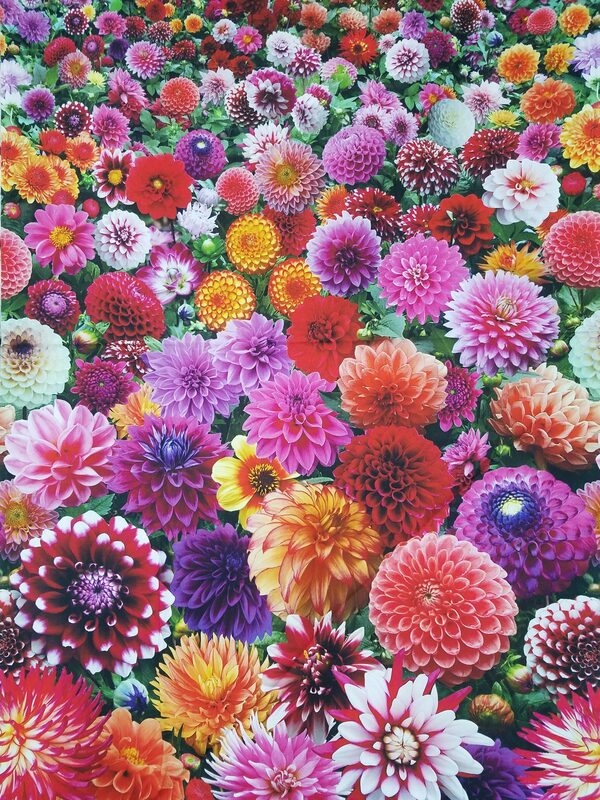 These dahlias look so realistic with all the lovely colors and shading. 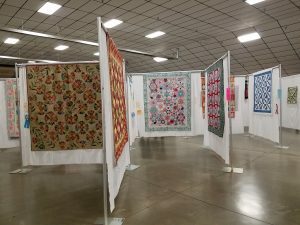 My local quilt guild show is coming up soon! 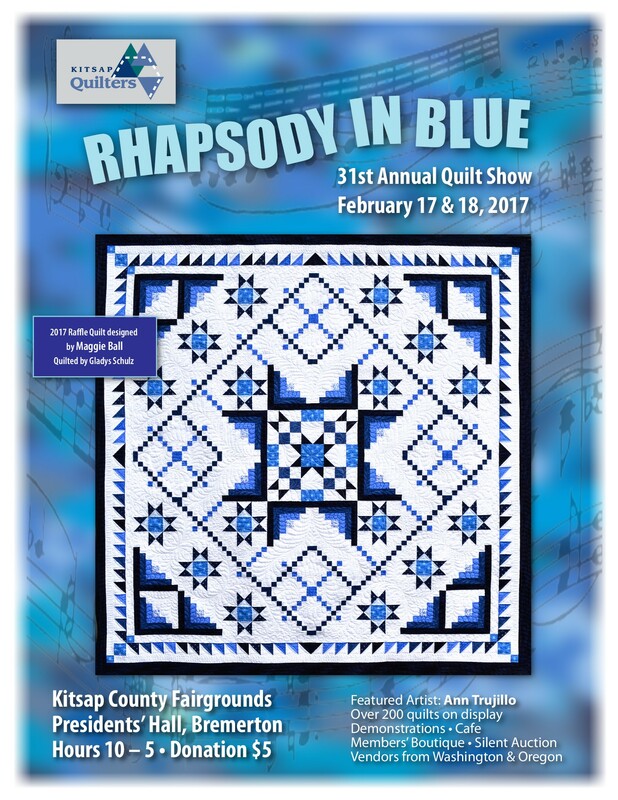 See Kitsap Quilters website. 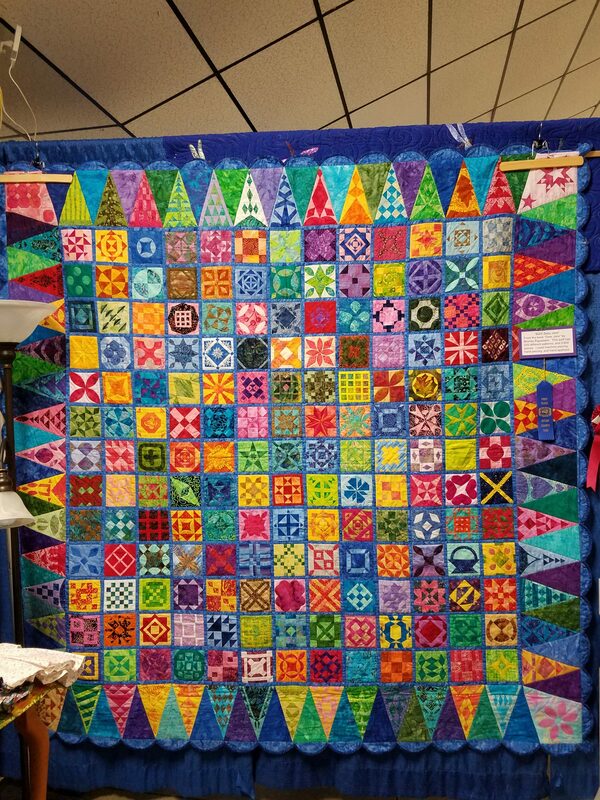 I designed the opportunity quilt shown in picture and coordinated making the quilt (more on this in another blog). 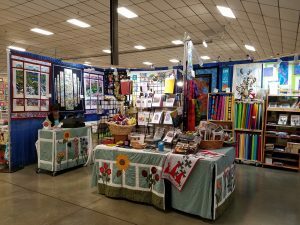 If you live locally, I hope you will plan on attending the show. Feel free to copy this list for judging and educational purposes. It is based on the criteria used by the American Quilt Society and the International Quilt Association.